Many CrossFitters have problems with fitting training into their lives. Brian Curley, though, has managed to successfully work being the fittest man over 50 into an already busy life. A 13:50 Nancy, 405 lb. 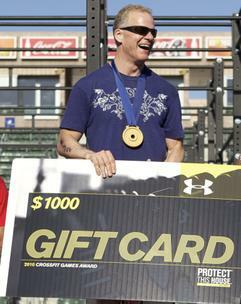 deadlift, and a 4:39 Fran won him the CrossFit Games Masters title in 2010. Brian Curley's not just an Again Faster sponsored CrossFit athlete, he's also an entrepreneur, husband, and father. He founded a manufacturers' representative firm in 1991, and has owned and run it since then. Balancing his many responsibilities is sometimes difficult, but his wife of 25 years understands and supports his passion for CrossFit. When it comes to getting his work outs in, CrossFit New England's class schedule allows him to train either in the early morning or later at night after work. Brian first got into CrossFit when he started to get bored of his normal distance running regimen. His wife bought him a few personal training sessions with Ben Bergeron. Once Ben opened CrossFit New England, he invited Brian to train. Like many CrossFitters, Brian found that the camaraderie and competition of group classes pushed him to a higher level of fitness. Competing in CrossFit provided an even greater stimulus to his training. At Sectional and Regional competitions he learned to deal with whatever environment and events he was provided with. Though he won the Masters CrossFit Games competition, he walked away impressed with the strength, "both mentally and physically." The highest point of the competition was the event he finished lowest in, the deadlift. Though he took sixth place, Brian hit a 20 lb. PR with a 405 lb. pull. Brian's planning to compete again in the Masters competition next year. His experience with competition has inspired him to train even harder and with better efficiency in preparation. Though when he first started CrossFit, he didn't he see himself as any different from other athletes. Now, through his win, he has seen the inspiring effect that his example has had on other people. He hopes that "in some small way, what I have been able to accomplish moves people" away from sickness and towards fitness. You represent the "Masters " of CrossFit well. You truely deserve the title of " The Fittest Man Over 50." Your performance at the Games has spawned a whole new crop of athletes who were not sure they could ever compete at the ripe age of 50. I guess that makes you a true ambassador of our sport. Way to go, Brian. 16 December 2010 / 7:40 p.m.
17 December 2010 / 3:35 a.m.
17 December 2010 / 3:20 p.m.
Way to go Big Brian. Watching you attack wods the way you do is awesome and inspiring! It is amazing what you do and how you bring it every time! Congratulations! 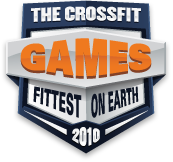 19 December 2010 / 7:56 a.m.
Big Bri represents everything that is awesome about CrossFit. The pure grit and determination he has is amazing, and you couldnt ever hope to meet a better person. We're lucky to have him at CFNE! Good Luck this year, Bri. We're all behind you. 19 December 2010 / 11:52 a.m.